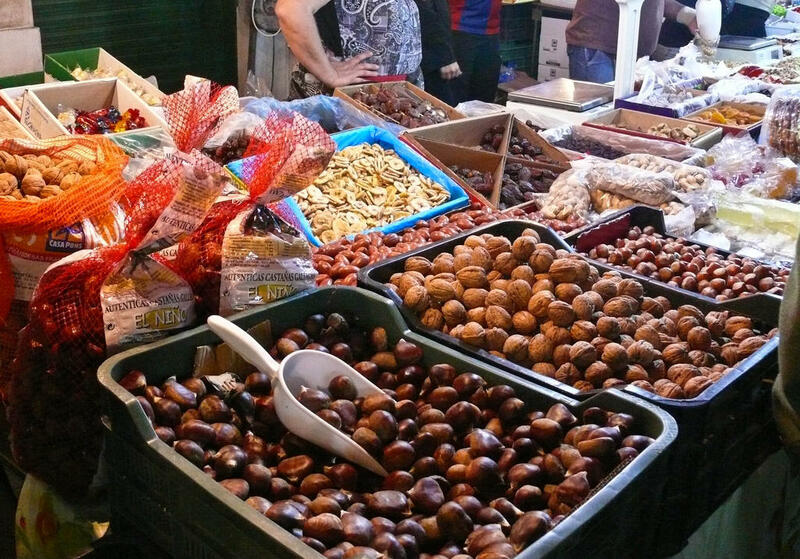 In Algeciras we celebrate November first, All Saint’s Day, with nuts. What I call “The Crazy Nut Festival” is actually just the culmination of the annual autumn increase in air pollution. Every corner has its resident chestnut roaster. Each sends a delicious stream of smoke into the air. They are all home-made contraptions, but basically of the same design. A metal container, most often a beer keg, houses the fire. 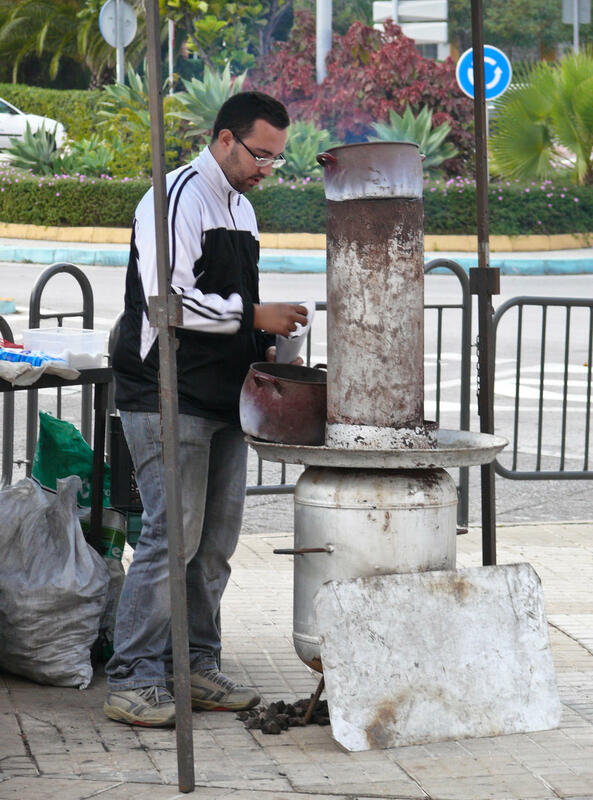 The heat and smoke rise up a length of chimney pipe, and a perfectly sized metal pot holding chestnuts is perched on top. Hot nuts are plucked out of the pot and placed on a tray that attaches the pipe to the beer keg. They perfume the air and stay warm until they are placed in newspaper cones. 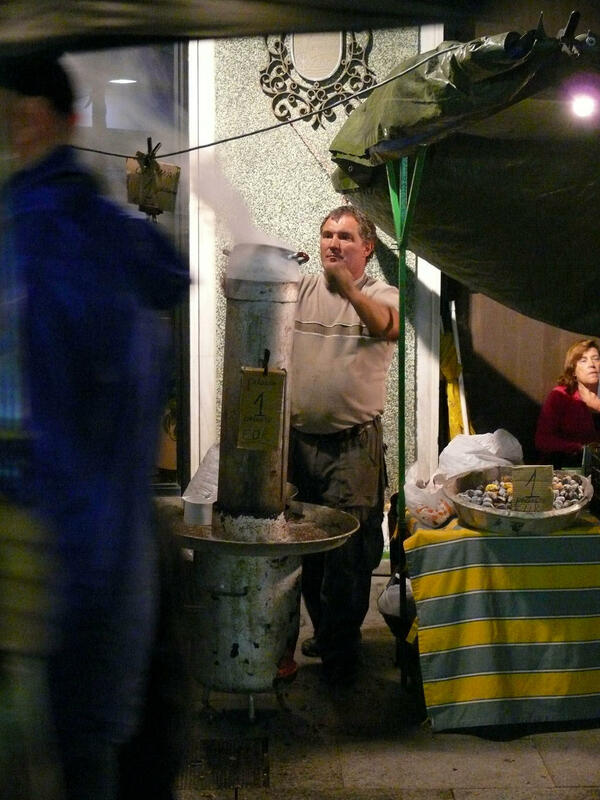 The chestnut roasters take up their corners in September. 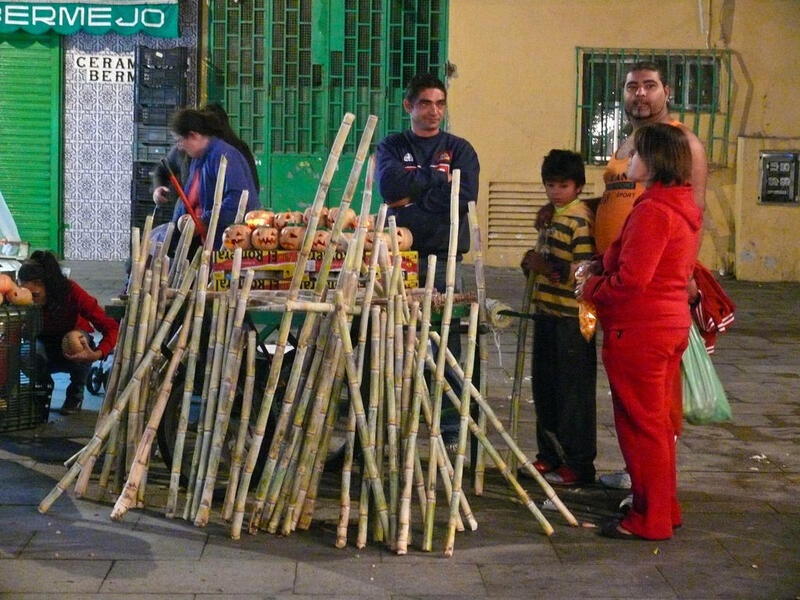 But the nutty madness ends in a huge, late night nut market on the eve of All Saint’s Day. Which happens to be Halloween night. Every year, more and more kids dress up North American style . So there are lots of ghosts and goblins running through the smoke. But the focus is nuts. 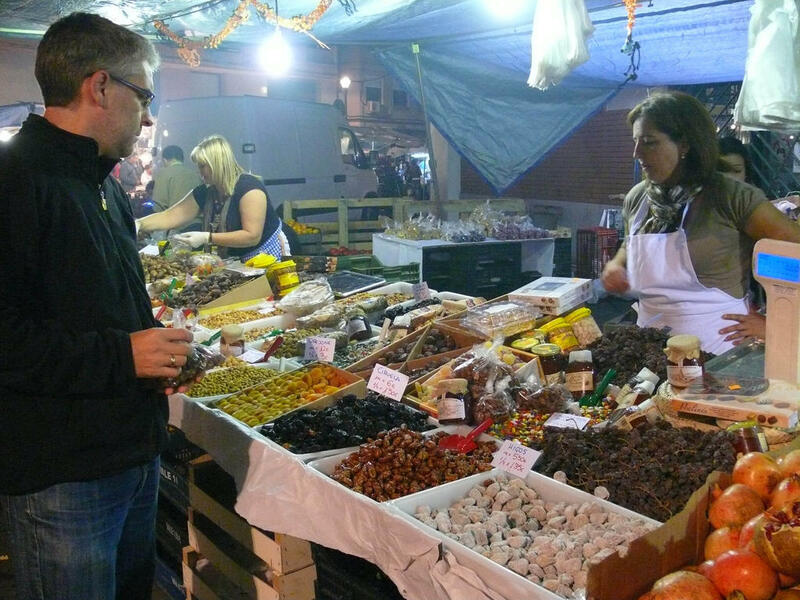 There are rows and rows of stands selling all manner of nuts and dried fruit. Most of the stands are family affairs. But these young guys decided to go upscale with their chestnut business this year. Multiple sales points and matching uniforms. Same beer kegs and smoke. In the old days, the market marked the end of the local nut harvest. Town folk stocked up for the winter. Now, you can buy imported nuts cheaper in the supermarket, but everyone still goes down to the crazy nut festival. Check out the crowd. And we went super early so Rogelio could elbow his way to an actual purchase. I needed my once a year treat of candied almonds. And now, as Halloween wraps up, the smoke clears. The department stores magically change from orange and black to red and green. Just when Christmas enters people’s conscious and I get the urge to feel Jack Frost nipping at my toes, for the first time in two months, there won’t be a chestnut roasting over an open fire anywhere. Today, September 16th, is Rogelio’s “Saint day”. 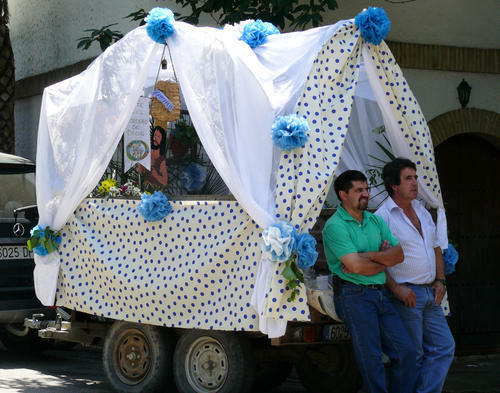 Most Spanish folk are traditionally named after saints or virgins and all have a corresponding day of celebration. So if you chose to celebrate your saint, it is like a second birthday complete with gifts, cake and phone calls from distant relatives. There are various levels of fame and religious wonderfulness that surround each saint and virgin. Santiago, or Saint James, who Yago is named after, now his story inspires a trip to the bakery. After Herod had his head chopped off, James managed to sail from the promised land to the shores of Spain, in a boat make of solid rock, and then resurrect himself. Not bad for a guy who must have been decomposing for a few months. For this he is officially “Head Honcho Saint of Spain” and a national holiday ensues on July 25. Cake for everyone. 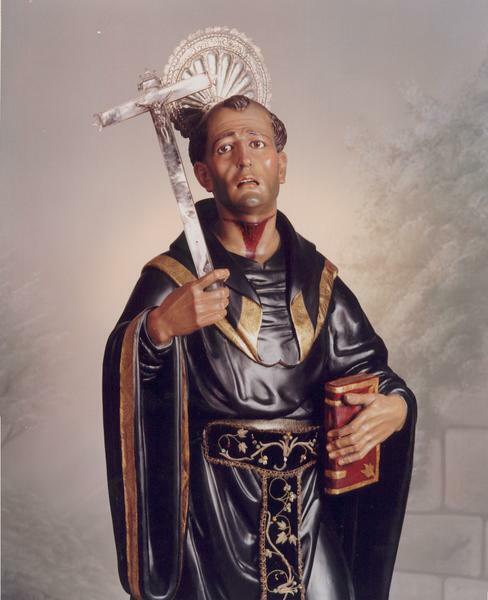 Saint Rogelio, on the other hand, was a run-of-the-mill 9th century monk from Granada. He had the brilliant idea of barging into the Mosque of Cordoba during Friday prayers to announce he was a big fan of Jesus. As you can imagine, that didn’t go over so well. Annoyed with the interruption, the Muslim congregation tossed him in jail and got on with their holy day. Eventually, Rogelio was put to death with 47 other Christians who could not resist the fun of charging into Mosques to yell “I love Jesus”. Kind of like the 9th century version of streakers who run naked onto the football field during the game. But back then the stakes were higher. They all got their heads chopped off for their trouble. Fearless believer, zealot with bad judgement, or village idiot lacking a television audience? I don’t know, but regardless, today the world’s Rogelios get to eat cake. That’s Saint Rogelio. Nice subtle representation of his decapitation, don’t you think? Besides the 5:00pm shadow, he doesn’t look a thing like my husband. There is still only one story in Spain. 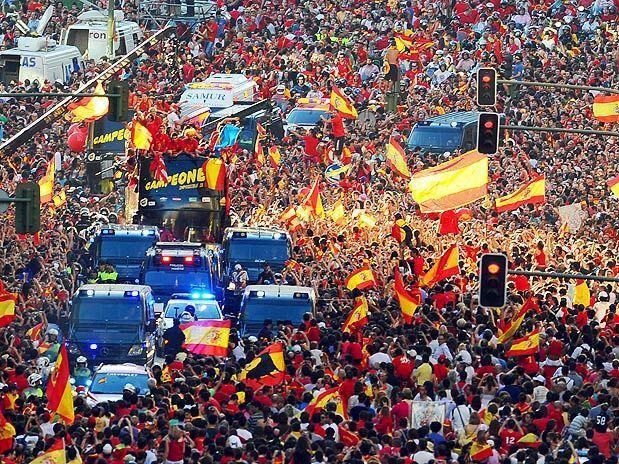 The World Cup heros returned yesterday to an unprecedented victory parade and street party in Madrid. Depending on what paper you read, there were between 1 and 2.5 million people in the streets despite the +40 degree temperatures. The crowd formed even before they had a chance to block the streets. The bus pushed through a hysterical mass of patriotism. They say a Spanish World Cup victory will be good for the economy. I’m not sure. Although I guarantee worker productivity rates have taken a hit in the last two days, beer sales are through the roof. National T-shirt and flag sales are also up, but they are all made in China. Time will tell whether octopus will become a national delicacy or a protected species. It is San Fermin in Pamplona this week. 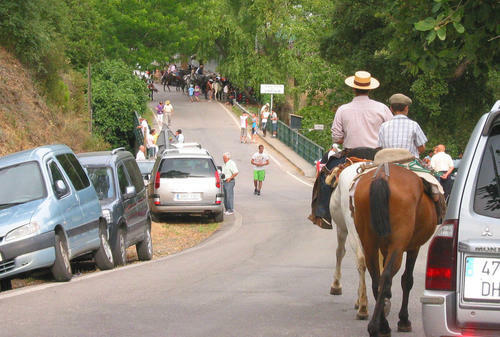 Although the running of the bulls is what you see on the international news as a Spanish curiosity, in fact it’s just a small bovine transportation issue during a huge religious festival. The origin of running of the bulls was not the brain child of bored drunk people with a penchant for goring. The bullring doesn’t have enough room for a proper corral, so the animals are kept about 800 meters away. 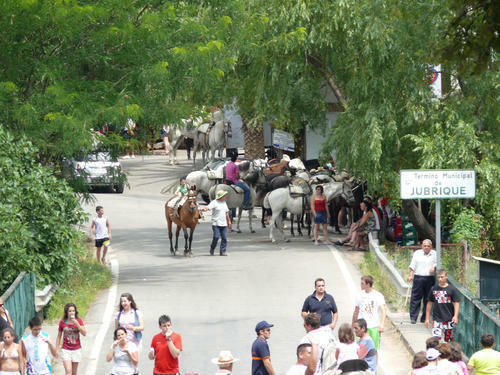 Every morning of the festival, at 8:00 am, when theoretically the streets should be quiet, the animals for that day’s bullfights are run from the corral to the ring. But now the poor things have a million drunk people in white pants and red scarves helping them along. Blame Hemingway. He loved San Fermin and made it famous in “The Sun Also Rises”. “Only” 15 people have died in the history of the running, although 200-300 are injured every year. Most of them are tourists. Rogelio always shakes his head and waves his fists at the tourists. He watches the running live every morning without fail. Apparently there is a correct way to yell at the bull while yanking his tail. Drunken stupidity is not credential enough to correctly endanger one’s life. Pamplona is a beautiful, small city. It has less than 200,000 inhabitants but is home to an extra million during San Fermin. Check out the crowd at the end of this video. Where do you think all those people eat, sleep and pee for 8 days? The first time I went to Pamplona, by chance and without knowing, I arrived the day after San Fermin. It was a garbage covered ghost town. Not a single bar or store open, not a single upright person to be found. But every shaded greenspace was full of sleeping bodies dressed in red and white. I thought I had walked into the apocalypse. I have never experienced a more peaceful day in urban Spain to date. Our weekend in Genalgualcil provided more fascinating study of the Andalusious Noisiosis, particularly of the male variety. From our viewing location we spotted two stragglers. They led us deep into Andalusious native habitat where we encountered the main flock participating in various spring rituals. As we saw the concentration of specimen our excitement mounted. Clearly we were witnessing a Andalsious Noisiosis event of National Geographic proportions. The female birds were clumped together deep in the nest, dancing to organ music. 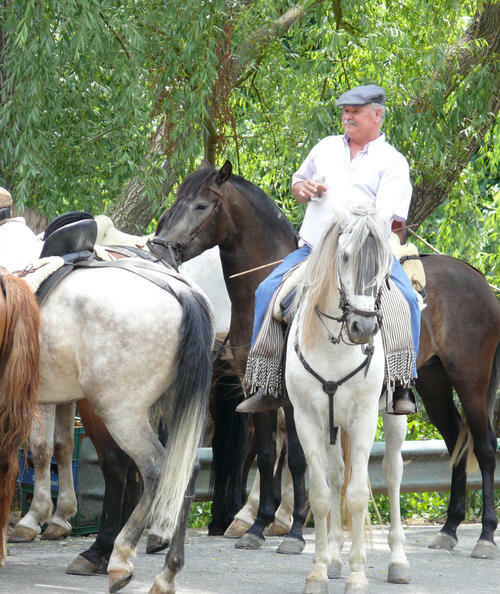 In response to the incessant mating calls of the females, the male Andalusious Noisiosis gathered in smaller sub-flocks, centered around various forms of transportation. This classic example of external plumage takes many forms for the Andalusious. Such vehicles appear to provide an important societal role: inter-male bonding. And give them a place to set their drinks down. Other males, clearly frightened by the dominant females and the organ music, and perhaps lower in the social hierarchy, kept their escape routes open while obtaining sustenance. With this puzzling behavioral anomaly, we recognized the need for deeper study. At which point we fought our way to the bar and further academic work was postponed indefinitely. 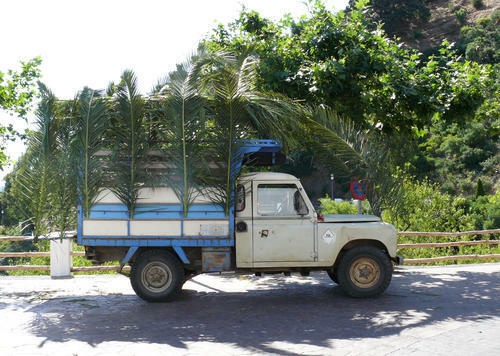 The species, Andalusious Noisiosis is abundant in the Andalusian region of Southern Spain. Unlike other birds, it is the females that sprout colorful plumage in spring. These birds are highly social and live in large groups. Their song is shrill and non-musical, but is a distinguishing characteristic due to its shocking volume. The females are also characterized by unique fan like appendages. This evolutionary feature combats the heat and flies of their natural habitat. More aggressive than their male counterparts, the females also utilize their fans to swat disobedient mating partners. 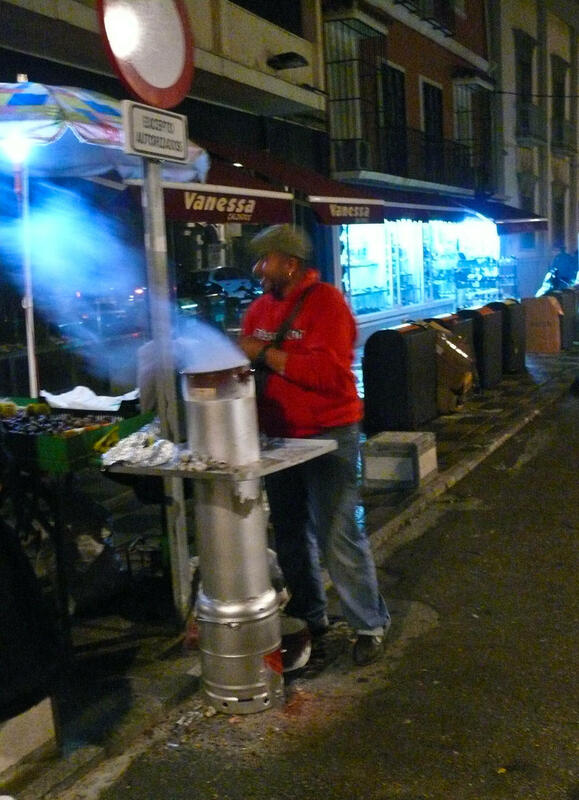 Sightings of Andalusious Noisiosis are particularly common in local fairs, parades and wherever food, drink and gossip are abundant. The early Catholics in Spain were brilliant at converting the pagan masses. Instead of imposing new religious rituals, they just renamed existing traditions. Suddenly, everyone was a practicing believer! 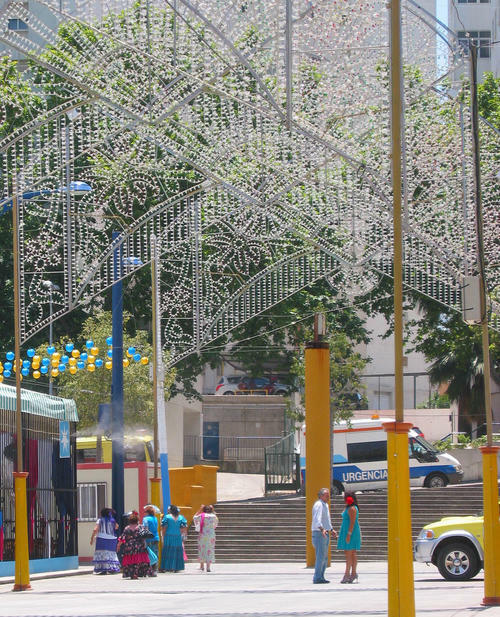 For example, the Day of San Juan (Saint John) just happens to fall on June 23. 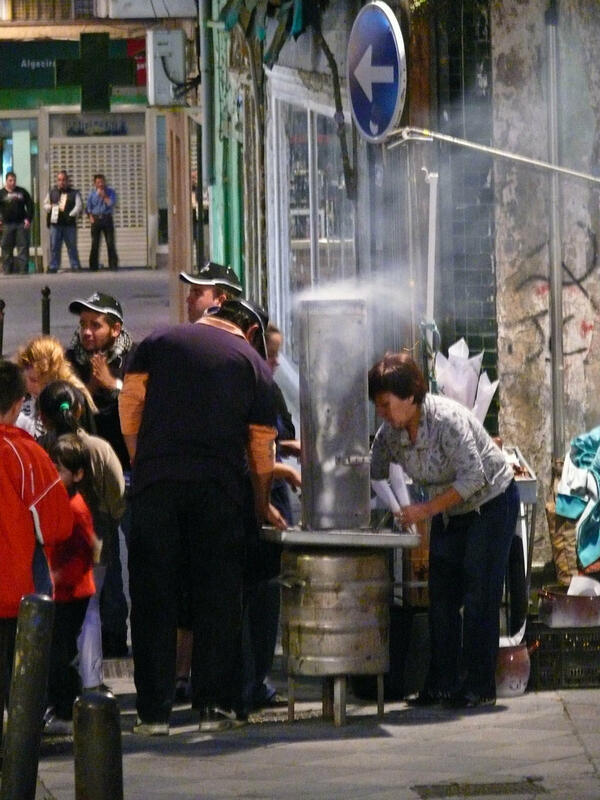 And to celebrate San Juan, people participate in cleansing rituals to celebrate rebirth. Images of water and fire figure strongly. You know, just like in solstice. The beach in front of our house is full of bon fires tonight. Jumping over the fire three times will bring good luck. And scorch your runners. (Just ask Rogelio). We received this phone call. My in-laws take evil spirits very seriously. 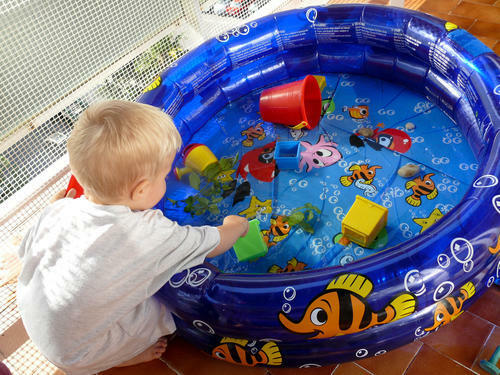 So I threw some spearmint and rosemary in the kiddie pool. but at least it will get things smelling sweeter. 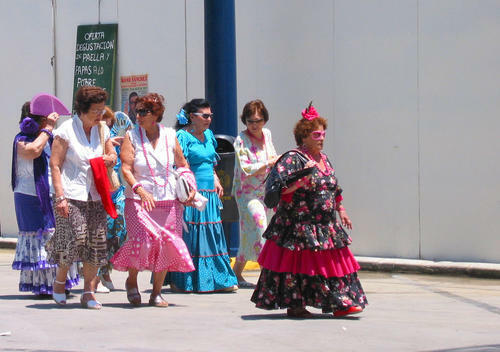 Break out the polka dots, its Feria! The fine folks of Algeciras are dusting off their polka dots. The fair starts on June 19! 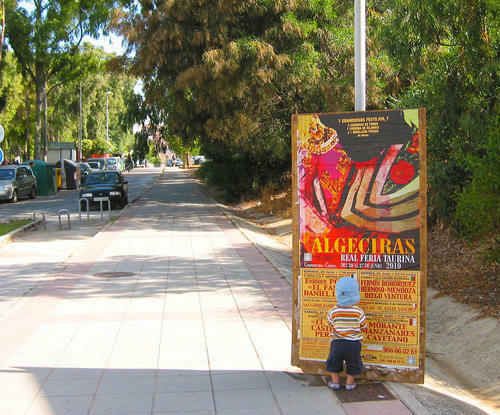 Yago is checking out the bullfighting line up. It is THE biggest event of the year. Highlights include the bullfights, a huge midway, and “las casetas” (the stands.) 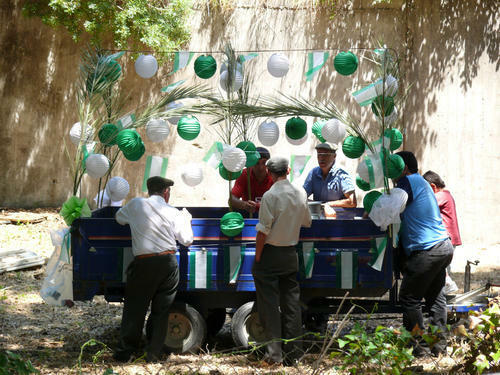 Important associations and businesses set up their own temporary bars. The fairgrounds are transformed into a temporary city, with lit streets and wall-to-wall temporary restaurants, bars and night clubs. Sometimes they are open only to certain members, sometimes they are open to the public. I’ll show you some photos during the event and you’ll get the idea. There are 72 casetas. That doesn’t include all the other food venders, regular restaurants, junk food peddlers etc. Eating and drinking. 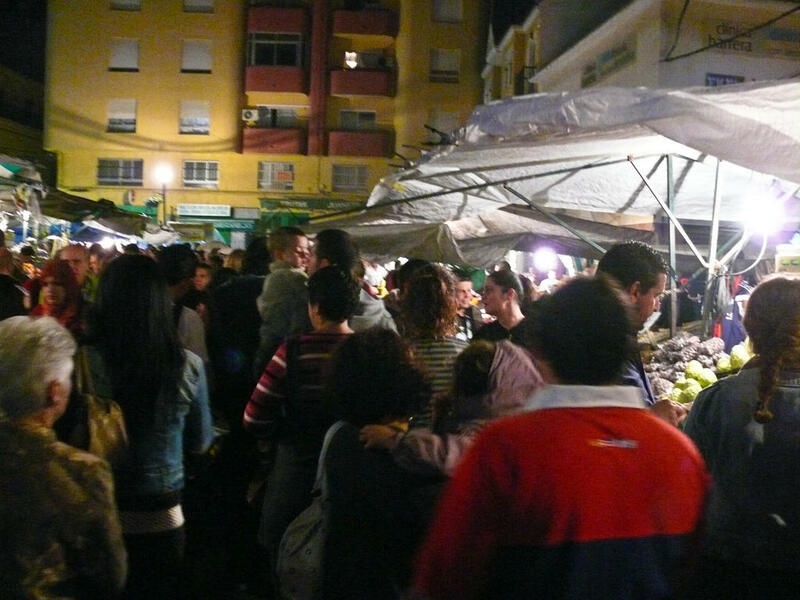 Feria is like everyday in Spain but you don’t have to walk as far. 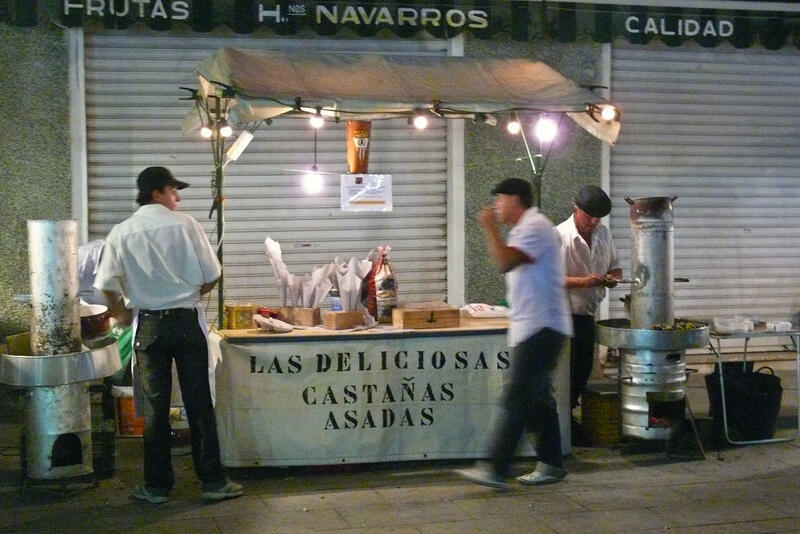 If downtown every second door opens onto a bar, for Feria they save you the trouble and every door leads to a drink. Businesses are decorating casetas. The city is erecting the ceremonial door. Bullfighters are looking for their pink socks. Don’t even try to get a hair appointment this week. So much to do. Tomorrow, dress shopping!